Hi quilters! If you are new to my blog, welcome! If you've been here before, welcome back! I'm so happy today to tell you about my 4th block that's been selected for Quiltmaker's 100 Blocks magazine! This block is not appliqued, like most of my blocks usually are. I decided to branch out and piece a block this time! Scandinavian Sun is the result of playing around with fabric to see what happens. I love yellow and gray together. It's so peaceful to me. And my love affair with solids is no secret, so combining them both was my starting point. Then I made a Log Cabin block with different widths of the "logs" to keep it from being too static. Look closely at the yellow portions of the block and you can see the log cabin block in there! Once that was done, I tried out an idea I've had for some time - instead of putting sashing around the block, what would it look like if I put the sashing through the center of the block? I love the effect - it's almost an optical illusion! If I were to ever make this into a full-size quilt, I think I would make the yellow part different colors on all the blocks - using a mixture of prints and solids. I'd also experiment with alternating the grays. Maybe half the blocks would be bright print backgrounds with the light gray sashing and the dark gray skinny strips and half would be bright solids with the dark gray sashing and the light gray skinny strips. Oooh! I like that! Maybe we'll do a quilt along this summer! Scandinavian Sun is the result of color and fabric play. The name pays homage to my Danish roots! So now on to the good stuff - the magazine giveaway! Quiltmaker is giving one lucky reader a complimentary copy of Vol. 9. All you have to do to enter is leave a comment below letting me know what color combinations you would use to make this block! For more chances to win, head over to Quiltmaker's blog for links to more giveaways and to read about the story behind the blocks! Until next time - happy quilting and good luck! I think the first combination I would try would be purple/pink/green, sounds strange but really works. or orange instead of green. This block would also be great in red/green/white as a Christmas quilt or red/blue/white as a patriotic (USA) quilt. Lovely block thanks for sharing. What an easy amazing block. I love it. Thank you for sharing it. A lot of potential with this block, Jenifer! I would probably try using my favorite go to combo of yellow, orange and maroon, with white. I love your block! Congratulations! Since I am of Scandinavian heritage, I would do it in Sweden's flag colors - blue and yellow and some white! thanks! Red, white and blue would make a great QOV quilt. Very nice, I think I would use Black with red and green or maybe black with black and white dots in the background and red shades for the rest. Lately I want to make everything in aqua, lime and navy. I think it would be great with this block! Very nice. My favorite colour is green so everything tends to have green and maybe browns or peaches. Thanks for the chance to win. White, blue, a light purple and green. I would like to make it in a variety of blues--or in black and white. Thanks for sharing! I'm a yellow/red girl. Love traditional blocks. I would make it in blues and yellows, or blues and whites--I have a thing for blues! Thanks for the chance to win! I love this block exactly as it is! As an alternative, though, I'd try it in black white, and apple green. Fresh and modern! I might try yellow and gray. But yours is great. I am in love with pink and lime green at the moment, and think this would be a great block for this combination. The colors you have chosen work well together. For me I like more vibrant colors so I would try deeper yellows and reds to see how that combo works. Pink and yellow is my combo for this block. Love log cabin blocks and really like your block too. Oh I see so many possibilities! Fun block! I'd use browns & teals & peach. Great block! Love your block! I think the color combinations are endless. I love yellow and grey. One of my guest bedrooms is done in yellow and grey I find the color combination very relaxing. Thanks for the giveaway! I would use the bright yellow, black and mint. What a fabulous block! Your grey looks blue on my computer and I love the combination of blue and yellow. So, that's what I would use. I think it would be nice in red, white & blue. I would use red, white and blue. I love the new shades of teal in Kona Cottons, so I would use three of those and a pale gray for the background. Thanks for the give away! Very pretty block. I would use some purple, bright pink and black...or maybe green with the purple and black...oh so many possibilities. What fun! I like the yellow, gray and black look. I might sub-in orange for alternating blocks in place of the yellow. I would stick with solids, though. Red white and blue would be great! Great block! I would use red, aqua, and white. Thanks for the giveaway. I would use blue, yellow and white. Thanks for the giveaway. I also love yellow and greys together. Your book on modern applique looks interesting. Guess I'll have to go buy it as a Mother's Day gift to myself. Red, blue and cream. Or maybe teal, purple and lime? I believe red and black on a white blackground would be awesome. Dark navy to light blue with maybe orange as the "pop" color in the center. Maybe one print thrown in too! I'm on a teal and purple binge; like to see how they would look with a crisp white and black print. Into reds lately...so black white gray red! I would make it with black , white and red. I like blues and white. Thanks for the chance to win! This is a fun tour and thank you for entering my name in the drawing. How about in patriotic colors. Interesting concept. I think I would reverse the colors as the yellow is too overpowering to me. I guess I am not quite that bold. I am also thinking pinks and lavenders would work also. I would use Blues, browns and creams.......lovely block!! Seeing as how I love purple, it would be purple-teal, purple-yellow, or purple and dark green. I'm thinking purples, greens, and golds! Congratulations! I would keep the yellow and replace the blues with greens and purples. I love the block. I would use purples and pinks for my niece. Those are her favorite colors. Congrats on another block making the magazine. I think I might reverse the yellow and blue in that block. I like cheery, but that much yellow would be too much for me ( : Also, I really like the tree quilt in your banner. Currently I have a crush on navy and orange. I would add some green for a third color. Congratulations! I think purple/green/gray would make a nice combination. Love your block, looks modern. Thanks. I really love this block. I love the colors you've chosen, so I've having a hard time coming up with my own. I usually like fall colors though, so maybe an eggplant purple, with a rusty orange and maybe a moss green? Congratulations on making it into the publication (again) and thank you for sponsoring the giveaway! Your block is just beautiful. I think that I would make this block with a pale yellow back ground with a variety of plane and green prints and purple strips for the center...that would certainly be colorful and spring like. Thanks so much for sharing. I like your colors, nice block, congrats and thanks for the chance to win. I think if I were to make your block, I would attempt to use up my Calico and Novelty prints. I have an ENORMOUS amount of Halloween Fabrics which I've been itching to use. I would put the prints in where the yellow is, the thin strips would be a spiderweb fabric. Black for the plus sign with a cute fussy cute pumpkin in the middle.....oh boy, I need to make this! :-) Thanks for the inspiring question! Maybe cheddar and a perfect shade of green. I love the name of your block. Red, white and blue would look great! I really like the colors you used, they look gorgeous together. Maybe switch up the blue for green shades for a spring/summer quilt. red, white, and grey! neat block! I love the yellow and gray. Green and grey with a pop of coral. I would use white with blues and greens. Warm sunny colors : tangerine, hot pink, lemon yellow with splash of aqua and brilliant purple! I am using lime green, orange, and yellow. I obviously am ready for summer. I would use red, white, and blue for a patriotic quilt. Thanks for the great giveaway! I'd use teal, mint green, pale yellow and probably a blue for the outline. Grey, sea foam, black and red. Gosh I wonder how that would look. Lovely block. I'm thinking of bright blues/whites, or maybe bright blues/lime green. Teal, mustard, deep red, and navy! But it's lovely just the way it is! 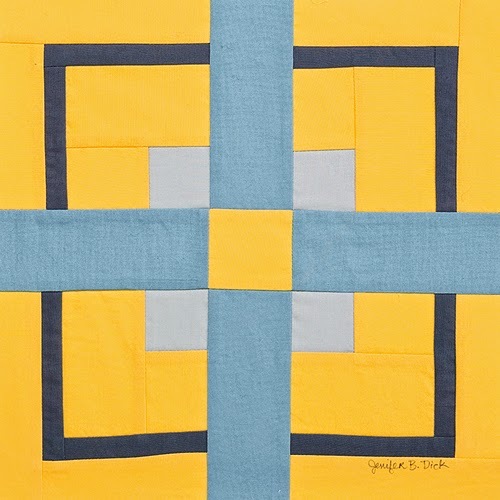 Love the block and your use of yellow..One day I would like to make a blue and yellow quilt and I think your block would be ideal for that. Great block. Red, white and blue would be my color choice. Great block - the color options are limitless. Just decide what you want and go for it. I would use bright red, white and blue and use it in a Quilt of Valor. Great block. I would want to see it in red, white and block. The color combinations (solids and/or prints) are limitless. One option I would like to try would be: purple for the yellow, lavender for the light gray, bright orange for the sashing and a golden yellow for the skinnies. Thanks for sharing. I would like to use a medium blue, red and white in your block! Orrrrr....orange, red, pink and white. Orrrr red, yellow and white! Heck, the possibilities are endless! I may just make of bunch of them in different colors!! Neat block. It will be great in a quilt. I think teal and grays would look pretty for this block. Love your block and the colors! Thanks for the chance! I would use shades of blue with a bright yellow. Congratulations on your block being selected. Thanks for the great giveaway. Wonderful block and great colors! Not sure what colors I would use. Thanks for a chance to win a copy of the magazine. I love your block and your color selection. I am becoming more and more interested in grey in a quilt. I have sewn with all colors, and your block would be pretty with a wide variety of color combinations. Right now I am making an orange and blue quilt for a friend who will be graduating from the University of Illinois in a couple of weeks. I think your block would be marvelous in orange and blue and playing with the placement of the colors. I think it would be a great Fourth of July quilt made in red, white, and blue. I would use gray, orange, and plum. This block has so many possibilities. Thanks for the chance to win! Might have to play with this pattern using my scraps. I would use anything bright...and maybe sneak in a fun way to use a stripe! Let's try a lime green print with dark blue sashing. I like red, black and grey combinations. Thanks for the chance! Purple and grey! Great block - I'd try it in greens/blues/purples. Thanks. I like earth tones of greens and browns. Great block. Love the combinations possible....I'm gathering fabric to make a black, white and grey quilt with a little lime green thrown in. I'm always drawn to crisp looking blocks, and this is a winner! I also like the quilt in your cover picture. I like the color combo in your block, but right now, I'm drawn to teal, orange, yellow and lime, so maybe something with those. I'd like to see this in plaids, any color. It would look totally different than your block but I think it would be cool. Yay your block is very cool! I would love to try it in red, black, grey and white. Thank you for the chance to win a giveaway! Purples where you have blues, teals where you have yellow, and yellow or lime green where you have the black stripe. By its simplicity, your block has endless possibilities. Love it. Being Norwegian, I may have to do the block in red and blue--haha! I do a lot of work with orange - so I think oranges and reds and yellows with perhaps greys and grey/blue for the sashing. My friends tease me that I like a butter yellow with a cornflower blue, so my block would not look too much different from yours! I could also see it in the good old red, white and blue! I love bright colors so I'm thinking teal & purple! I see this block in yellows, purples, and then some yellow greens as the accents sashing. I would like to make this block in aquas and greens. Thanks for the design! I would use blues and purples. Great block! I would use neon green and purple. Way cool. I think I would do a light and dark purple, with pale green background. I would use pinks and greens. Thanks for the giveaway. Black and white and then would add a smidge of either red or yellow. I think it would be great in pink and grays. Soft green, pinks and white. Thanks! What you've called grey looks blue on my monitor and blue and yellow is one of my favorite color combos. I can also picture this as a great scrap quilt block, using lots of different colors. Thanks for the chance to win a copy of Vol.9. Nice block! I would make this in red & aqua. Thanks for a chance at the give-away. Since it is called Scandinavian Sun...I would most definitely use a nice yellow, then add some red and maybe a little orange to resemble the colors in a beautiful evening sunset. I'm thinking red, white and blue would make a very striking block! How about some jewel tone batiks for everything but the skinny middle sashing and do that in a bright (maybe lime) pop of color? I like blue a lot, but I think it would be a better color for the grey part of your block. I may use a yellow or lighter cool color for the yellow parts of the block. Thank you for a chance to win. I love yellows and greys together too. It's so refreshing. Thanks for the chance to win. I love purple! So, I might use a Batik purple with a dark grey and a pink! I love the simplicity and harmony of this block. In it, I'd use fresh blues and greens offset with white. I might reverse block colors and alternate them when I assembled the quilt. So many possibilities! I guess that's why I've just started quilting - every piece can be so original even though the pattern might have been done 1000 times before. It's such a wonderful mystery that old can be new again...every time. I'd use pink, green and white! I would use different prints in aqua and red. That is my favorite color combination at the moment! Love what you did. I think a Copenhagen Blue & white would be nice. Here is my Danish name-Waldbjorn. Thanks so much for the chance to win. I think red, white, and blue would look nice. Thanks for the opportunity to win the giveaway. I can see this in red, black and white. I would go for aqua grey and red. Always a cheerful mix. How can you beat yellow and grey? It's wonderful combo! But I would also try yellow and purple too. Lots of jewel tones with yellow! I would use aqua and red for the block. I would use shades of purple with a pop of bright green. Your yellow and blue combination is stunning. How about red white and blue!!! Yellow and gray; what a unique combo. However, I'd probably switch the use of your yellow & gray in the block around, so that it's yellow on gray. And maybe have the thin sashing be a rich, dark red instead of yellow..
Cranberry and gray are my favorite color combo. I like a true gray not easy to find. Brown and yellow would be my second choice. I'm liking the greys these days but would pair with various dusty hand dyes I have. Your color combo is beautiful, but my favorites are always scrappy quilts. Congrats on being published. Thanks for the giveaway. I think it would look wonderful in some Kaffe Fassett fabrics! Thanks for the chance to win. Red, white and blue. I have Quilts of Valor on my mind. I think this would look great in red white and blue as well. I love patriotic, red, white and blue quilts. The look especially good with a geometric design. Gorgeous block. Thanks so much for sharing. My first instinct is purlpes and oranges. Not sure of all the colors, but I would bet on a purple and a red with some yellow and who knows what the other colors would be-depends on my mood at the moment! Navy, orange and white. Great block! I would go with a blue, green, yellow combination. I like cheerful and bright right now. Thanks for a chance to win. Definitely an interesting sun shape in your block. Good on you for thinking 'outside the box'. Thank you for the chance to win. I like the yellow and blues. It goes along with my husband family history. greens and greys! my favorite color combo!